I need to walk more; today, a good long morning stroll with a friend was very enjoyable. A few days ago, I bundled up, put some grippers on the soles of my boots and headed to the lake for a bit of a ramble and a breath or two of fresh, cold air. If the sun just happened to be shining, so much the better for taking a few ☀Sunlit Sunday pictures. There weren't many people around, just some parked cars with those inside looking out on the chilly day as well as several workers clearing up the branches and tree limbs that has fallen during the December ice storm Without a wind, the crisp day was beautiful and bright. On another sunny note, a big, brown envelope came in the mail , courtesy of Carol from Art and Sand. Carol enjoys creating things and decorates her charming home with vibrant colours; her blue shutters, colourful garden and painted furniture speak to me, as does her husband's artwork that hangs on their walls. Hearts are throughout Carol's home. When commenting on her post, Home is Where the Heart Is, I mentioned the lovely heart/floral garland that was only partially visible. Soon afterwards, I received an email from Carol saying she had made it with the intention of giving it away and wanted to send it to me. What a surprise! It arrived on Valentine's Day. Look at the details on each heart. The garland came with the two tiniest clothespins I've ever seen. I can imagine it hanging in a few different locations, but opted to put the garland in the guest room. The room also houses my laptop and the sewing machine I intend to use more regularly; this string of prettiness can act as some "hearty" inspiration to do so. Thank you, Carol. Finally, another bright spot in the week was the arrival of this foster girl, Claire. I'll share some more photos and a little of her story in a day or two, when you'll be able to see her lovely face. Let's move along to your posts. Hi sweet kitty Claire. I look forward to learning more about you. You are gorgeous! Your snow photos are so pretty and that is the cutest garland. I love your garland and I'm sure it brightens up your guest room. We had similar ideas this week about walking by the water. Claire looks adorable and I'm sure she is settling in really well. Can't wait to see more photos of her. I like the photos of the open water and snow filled landscape side by side. The banner you were gifted with is adorable, another kind and thoughtful blogger! Claire is such a pretty girl and it's nice to know she is warming up to you. Beautiful light on the water. And the picture of Claire s wonderful...Have a wonderful day!!! Your pictures are so, so pretty. I need a good long walk, hopefully our temps will go up in the coming days. 16 degrees now. What a sweet, thoughtful and absolutely charming gift Carol sent. She is very crafty and I love her blog. Yes, you have picked the perfect place to have it!! Wonderful photos . It has been a lovely sunny few days here to and calm winds makes for nice walks with my Miggs . Oh kitty has lovely colours . Such cute little hearts . Thanks for sharing . Have a good week ! The water looks fantastic with the sun and snow. That's so nice of Carol to send you those lovely hearts, and to time their delivery perfectly too! I am going out of town tomorrow, so I am going to link up with you now, even though it's not Sunday for a few more hours. I hope that's ok. Have a nice week, Karen. Beautiful winter scenery. I need a walk too! Hoping the weather holds up this long weekend. That's a really sweet gift, and I'll be back to see Claire's lovely face! Doesn't the sunshine seem to make the snow so sparkly and cheery. I know many are tired of snow but it doesn't make for some lovely photos. That heart wreath is so pretty. Can't wait to meet Claire, I love her markings. I'm looking forward to see and read more about the cat. So Claire has arrived. She looks like a typical cat - assessing the situation before acting, unlike puppies who just run in without thinking. Thanks for the sweet shout out. I forgot to take pictures of several of the garland I created. I love your term, "hearty inspiration". Happy Sunlit Sunday! And, what a bright and sunny one it is, both inside and out, with Carol's sweet hearts that are sure to bring a smile to even the shiest of little faces, (Claire's included! 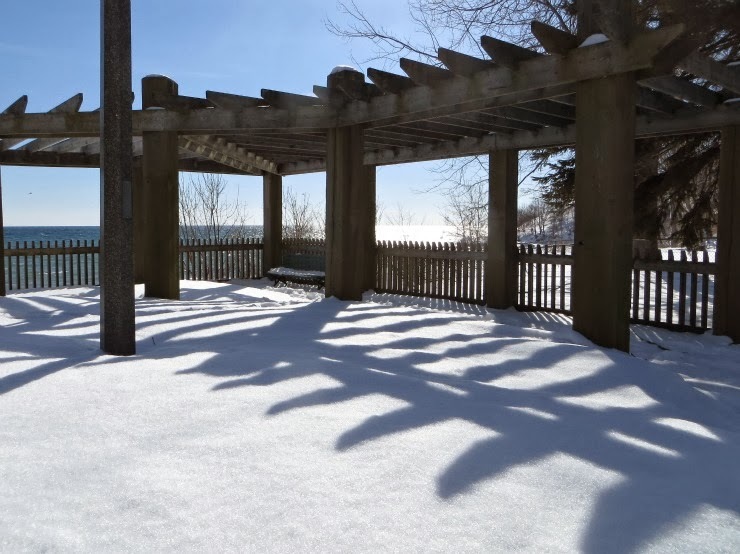 ), and those crisp, bright, blues and whites of lake and snow, to invigorate body and soul! Thanks for hosting and have a happy week, ahead. Thanks for hosting. I need to get out and walk along Lake Superior before the snow all melts... which I am sure won't be for a while. Hopefully we get some sunny days next week to go out and do that. Love your heart wreath.. what a wonderful gift. Lovely views from your walk, looks like a cold but pretty day. I love your cute garland, what a wonderful gift. Have a happy day and week ahead! Lovely hearts and beautiful snowy pictures, a walk on a chilly day in the snow gives so much fresh energy. Last picture of your 'new' cat is wonderful. Looking forward to hear more about her. Thank you for hosting. Love to see your open water and blue snow. We had heavy snow the other but it completely melted today. I could enjoy the snow for two days. Thanks to your advice there was no problem to join Sunlit Sunday this time. Thanks for hosting Karen! I love your pictures of the lake. I can't wait to see more of Claire! I've included a photo of my "Sloan" in my post today...although he's looking a bit grumpy! Have a good week! Awww, your foster kittie. I look forward to getting to know her better. Lucky kittie!!! That snow covered beach is a dream. Truly breathtaking sight. Especially with the sun high above. Have a great sunday. Love the sun shining on the water. Have a good sabbath day. The sunlight sparkling on the water is beautiful. I haven't been to the shore lately but I think it's completely iced in - at least on or side of the Island. The North Shore is rarely iced in completely. They even surf up there in the winter. The heart garland is sweet and what a thoughtful gift! There's little sunshine here this weekend, but a lovely glow from the fire in the stove. What a sweet thing for Carol to do - the hearts are beautiful! How cold the lake looks. Brrr. How brave you are to head out for a walk. Carol is so kind to send you the heart garland. It's lovely and sure to brighten up your sewing/guest room. Hope your week is full of good things. What beautiful snow images. Thank you for hostessing this blog party. I can't believe it!!! 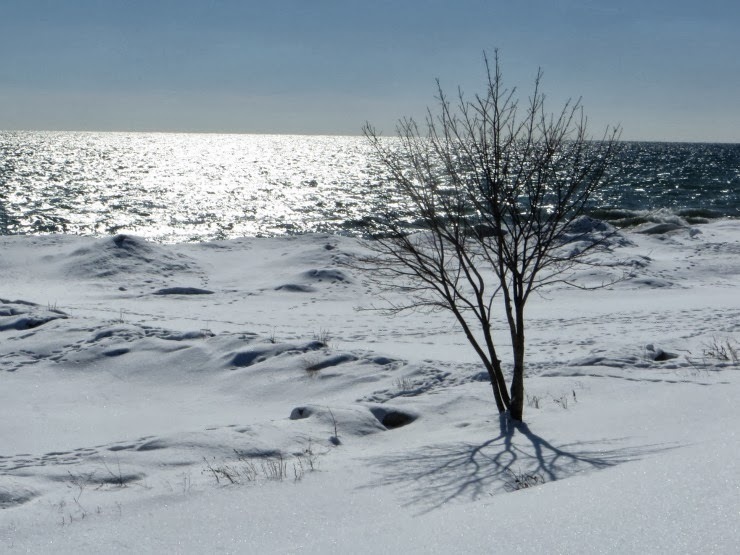 Is that snow up to the shoreline - or are my eyes playing tricks on me? Beautiful images of a sun shiny day! I love Carol's blog - it's a happy fun place to visit. Carol is so clever with all she creates - what a sweetie to gift you her gorgeous garland! whoever stays in your guest room will love it too! Thank you for hosting this friendly Sunday party! I'm wild about the little hearts and so cheerful in this long snowy winter. Posting soon! You are brave to venture out... me not so much. I'm looking forward to no snow on the paths and roads so I can go out walking. The beach is a great place to go for longdistances. What a nice surprise all those hearts, and a perfect time of the year for this garland, lucky lady. 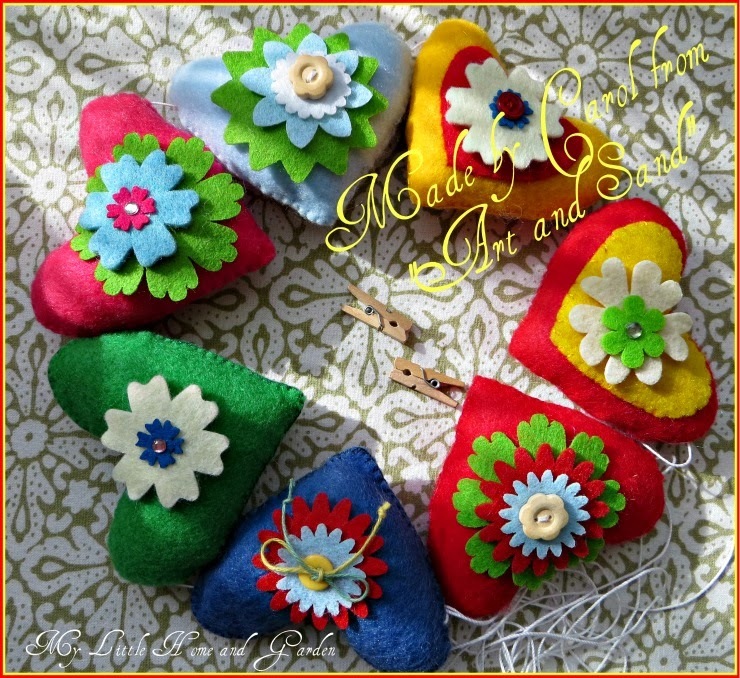 I LOVE the felt hearts with flowers and buttons. How cheerful! Hi Karen, Your outdoor photos are beautiful. Snow does make for gorgeous images, doesn't it? Glad you are getting out and getting a little fresh air and sunshine. 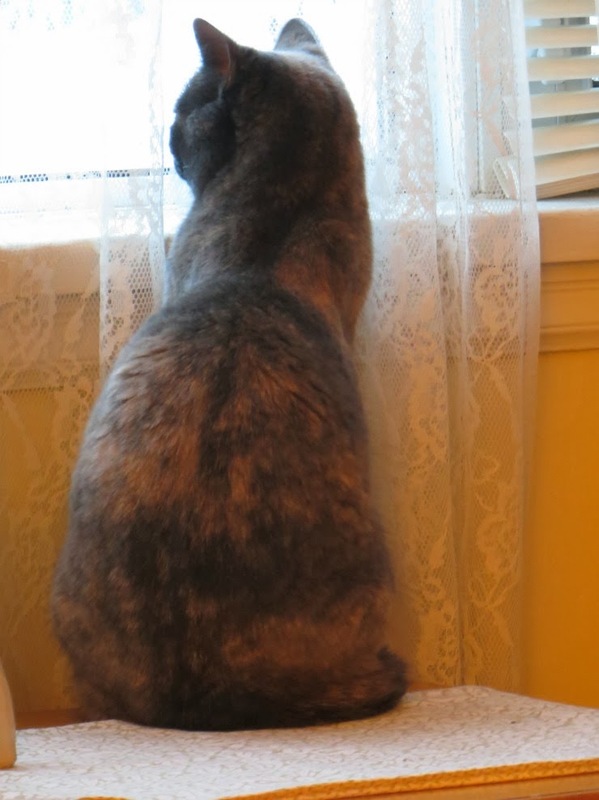 Claire looks like a pretty girl and I think she likes looking out the window. So nice of you to care for her! Karen, the panoramic photo of the lake is so very beautiful, a wonderful photo.